My professional work has moved more towards mastering over the last year and although some mastering guys here will no doubt freak at a 500 module being used, here is where I differ. After testing the SOC-20 and the Pendulum OCL, the shaping modes available in the Essence are the game changer for bus work & mastering for me. Although the Mid/Side mode of the SOC-20 would be nice, this can be setup externally and I actually prefer digital mid/side processing for this job. M/S is a bit fashionable and not something you need to use a lot in my opinion. Fabfilter Pro-C does a great job if I need it. Everything that I heard in the single Essence is preserved when running on a stereo bus, the lowend extends in a harmonic way, the midrange gets clearer and more forward in a musical way and the topend is smooth as silk. Engaging the box with no gain reduction sounds great. The grab of the unit can be fast and slamming or subtle. The tone when compressing stays round and smooth with a modern sheen at modest levels and this reminds me of the OCL-2 but with a bit more bite. You can change the feel of a mix with the stereo link feature, sometimes linking them tightens the image too much and going unlinked is just the ticket to preserve movement and spaciousness. I've mastered 3 projects with the Essences and they have been great next to my more regular tools. Clients have noticed a change in overall warmth and listenability to their masters and I've had no recalls as of yet! :-) Using the Essence make-up gain to clip my HEDD or just gain up into the limiters is a great toneful way of getting more level. With switched ratio, attack and release however, they are easy to recall as the drives can be matched by ear and the metering is good enough to ensure the image stays locked. Matching gain makeup is done with a test tone to be sure its 0.1dB accurate, but it's quick and easy and the pots are weighty and nice to turn. Where I think the Essences win over the SOC-20 for me are the sidechain high and low shelving EQ switches. These are FABULOUS. You can cut lows and highs and have the thing stay big on the lows and focus on the vocal midrange, with the sweet tone enhancing the expensiveness of a vocal delivery. You can boost highs and really grab a harsh mix... or boost the lows and tighten a bloated one. The results are varied and always useful with a simple switch flick. I like "simple to use" equipment... The SOC-20 does not have these filters and it doesn't have the 70mS attack setting - both of which have become essential features for me on the Essences. Auto attack and auto release can be a great way to smooth out a lumpy mix @ 2:1, or conversely 5:1, 70mS attack and release 100mS (1 is 100mS I think?!)... can firm up a mix, keep it big and not strangle anything whilst adding real weight. 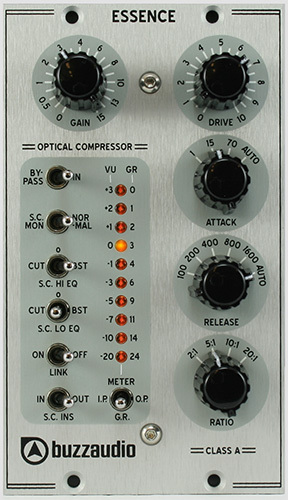 Killer 2-Bus units, phenomenal on kick drums & bass and a great lead vocal compressor. These things sound good on an instrument bus, any kind of source. They are a better box to my ears... and great value. Tim nailed it. With the external side chain keying options and the sidechain monitor etc... the tone and the build quality, these should be raved about more often. Sleeper gear that I'd prefer to keep to myself but I promised Tim I'd write the review! Check them out. They are timeless and excellent.